It’s a busy time of the year for Barrow Town centre, with the Barrow BID Clean taking place on 30th August ahead of the Tour of Britain coming to town just over a week later on Friday 7th September. There’s plenty to get excited about. It’s a fantastic opportunity for local people and business owners alike to show their pride for the town and to celebrate what makes it so special. 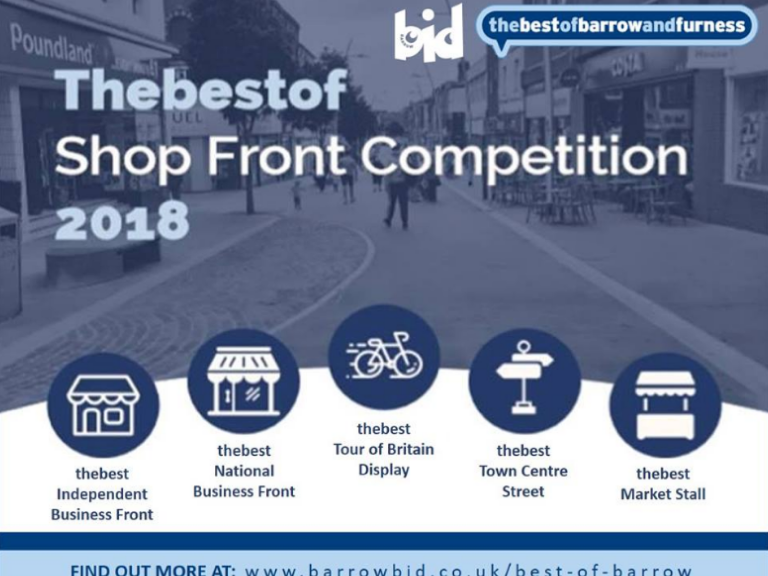 To coincide with these events taking place, here at thebestof we’ve teamed up with Barrow BID to find and reward the businesses who go that extra mile to make their business premises stand out ahead of the Tour of Britain coming to Barrow. We’re thrilled and delighted to be working with the BID by encouraging businesses to do something different and stand out from the crowd. The bestof Shop Front Competition is the perfect chance for businesses to get involved, get creative, use a bit of imagination and have the chance to win some fabulous prizes – including a year’s marketing package from us worth over £1400. There are 5 categories for this year’s competition. The best independent premises can win a marketing package from the Best of Barrow worth over £1400. All you have to do is ensure that your shop front meets our critera when a panel of judges goes around the town on September 3rd 2018. Does your National business take pride in its appearance? Like the best Independent competition, we will be judging National Chain stores on the same criteria. We want to see how National Chains set the standards for how a high street shop attracts customers in. Best Tour of Britain window display. The Tour of Britain comes to Barrow on Friday 7th September and we are looking for businesses to get involved. Create a display that tells customers you are supporting the Tour of Britain. You could create a green display to match the Tour’s main sponsor and winners jersey, create something that is quintessentially British or go for something cycling related. We want to see how your window display welcomes the Tour of Britain. This category gives businesses an opportunity to work together to make their street the best. Is your street weed free? Is it clean? Do all the shopfronts look good, have you gone the extra mile? Our BID Clean event on Thursday 30th August presents a great opportunity for business owners and managers to work together and make their street the Best in Barrow. Market traders may not have a shopfront to be judged on, but how do you attract customer?. We are looking for innovative ways that market stalls attract customers. We will be judging on the criteria of our shop fronts, but also would like to see how market traders have embraced the Tour of Britain, or how they have come up with an innovative way of promoting their business. Judging takes place on Monday September 3rd, with the panel; consisting of members of both thebestof Barrow, Barrow BID team and the Town Mayor walking through town deciding this year’s winners. What standards they are decorated to. Do they have relevant and nice signage? Do they have clean windows? Do they have a beautiful, attractive window display? Good luck to everyone taking part – we can’t wait to see your efforts on the 3rd September.